The Chicago Park District announced the opening of OUT OF SIGHT, a public art installation based on the popular outdoor game hopscotch, on Saturday, June 9 at Maggie Daley Park, located at 337 E. Randolph St., at 11 a.m. 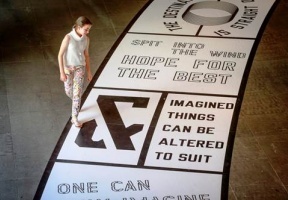 Pioneering American conceptual artist Lawrence Weiner’s inspiring participatory work will be unveiled during an engaging outdoor event featuring speakers, performances, activities, and giveaways. OUT OF SIGHT invites the public to explore the outdoor installation and think creatively about the direction of their lives as they encounter the floor-based work. The installation combines wit and whimsy in a game-like format, encouraging learning through the use of graphical phrases embedded throughout the work such as: “One Can Only Imagine the Powers that Be,” “The Destination is Straight On,” and “Assuming a Position.” By being able to stand, walk, or jump from one position to the next, OUT OF SIGHT inspires visitors to consider the importance of recognizing how to accomplish their life’s goals. For exact tour dates and locations, visit www.chicagoparkdistrict.com.